Here you can see an interview made with Cornel Burzo, 6d(Cornel on IGS). 1. We see you improved from 1. dan to 4. dan in a year back in 1997. What was the key of your improvement? 2. We see you had good record on your last tournaments(Japanese Ambassador Cup in Romania, Pandanet tournament in Barcelona and EYGC Open). You lost only three games, against two 7d and one 6d, while winning 13 games. Was it only good luck or can we see you coming to 7d soon? 3. You have a good number of students. I think I can see you teaching more often than other amateurs, and a lot of your students say good things about you. What is the key of your teaching success? Probably is because I started to teach online back in 2000 when there were like two teachers on the market (Guo Juan 5p and Yang Yilun 7d) so I could offer a cheaper service and my fluent english helped me explain better the game to my students..
4. 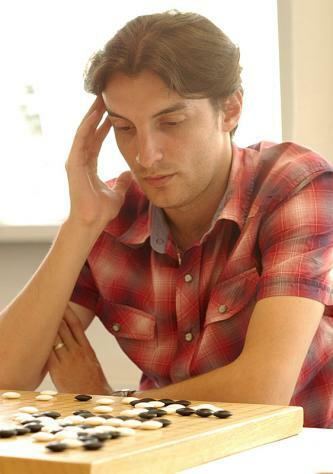 What do you think, is memorizing pro games useful for amateur players? 5. What do you think, is there a great difference between online games and real-life games? not sure how big is the difference but there is certainly one, first of all in real-life games you see the board on horizontal not vertical..that's always a shock for me cause I am used to play many games online but while in tournament I take my time to adjust..
6. Are online qualifications for world cups a good choice, should EGF accept online tournaments for rating? I think is better to play live games if they have any importance toward ratings or qualifiers..
7. What do you think about difference in strenght of go servers, compared to real-life tournaments? I play on 3 servers mostly, IGS, KGS and Wbaduk..I think KGS is closest to EGF rating for dan players at least..on IGS or oro the dan level seems pretty inflated recenly..they should demote 1-2 stones..
8. Do you think you are strong enough to pass the pro exam? 9. If you can chose,where would you become a professional? You can put the interview in Goama magazine.